First, it was Rangers who were on the verge of doing the “unheard of”, that is grabbing victory in Maiduguri. They, however, got a point in their kitty – the first club to do so this term. The Borno Army managed to equalize in the second period, thereby bringing to an end their 100 % home streak victory after 424 (calendar) days. Before this draw, El-Kanemi had won 24 successive home games. This feat for Rangers is coming against the background of some shoddy outings. They will have to consolidate this point by gaining maximum points in their next league game, at the Cathedral against. Yaw Preko had to put the disappointing show in Lagos behind him as his lads rallied at Ifeanyi Ubah International Stadium, Nnewi to humble ABS FC 2-0. The two goals came in each half and two Ivorian imports, Yaya Kone and Seka Paskal were on target. The win takes FC Ifeanyi Ubah to the second place on the log, five points away from leaders Plateau United. Other results were quite impressive. Lobi Stars’ hit man, Tony Okpotu becomes the first to get double hat tricks in this season’s campaign as his three goals hugely contributed in the demolition of MFM FC at the Aper Aku Stadium, Makurdi. Despite the win, the Pride of Benue are still a notch behind MFM FC. The Fidelis Ilechukwu led side are 4th on the log with 37 points, followed by Lobi Stars who are 5th on 36 points. Rivers United’s poor run on the road continued at the Confluence Stadium, Lokoja. Niger Tornadoes got the solitary strike as early as the 13th minute. They homers could not increase the score line; neither could Stanley Eguma tutored side restore parity. Kano Pillars’ road trip to Ibadan did not end in futility. The lads from the Pyramid City held Shooting Stars Sports Club to a goalless draw. 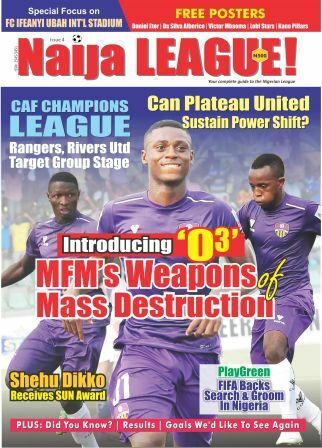 Results like this for Shootings herald demotion to the lower tier of Nigeria club football. In the same vein, Enyimba FC added to the woes of Gombe United at the Pantimi Stadium, Gombe. The Elephants took the lead through Ikechukwu Igbenegbu, but could not hold on to grab victory on the road for the second time. The home side leveled the score, yet they are still walloping in the drop zone alongside Sunshine Stars, Shooting Stars and Remo Stars. The Stars are not shining. Kenedy Boboye led his table topping side to a victory on the road, against Sunshine Stars. The Akure Gunners, through Thompson Ezekiel, took the lead at the half hour mark in the much talked about encounter. The homers went into the break with a 1-0 lead, but could not withstand the potency of the Jos based side as Emmanuel Odafe leveled the score line in the 62nd minute of play. The league leaders went ahead to win the game in the dying minutes, 1-2. With this three points, Plateau United have established a 5 points gap at the summit of the league they are keenly followed by FC Ifeanyi Ubah who occupy the second spot. Plateau United becomes the first team to score more than 30 goals this season. Niger Tornadoes 1-0 Rivers United. Gombe United 1-1 Enyimba Int'l. Lobi Stars 3-1 MFM FC. Nasarawa United 2-0 Kastina United. FC Ifeanyi Ubah 2-0 ABS FC. Sunshine Stars 1-2 Plateau United. El-kanemi Warriors 1-1 Rangers Int'l. Shooting Stars 0-0 Kano Pillars. Abia Warriors vs Remo Stars. Good there was no violence recorded in any of the centres especially from the centres away teams didn't lose and that's good for the growth of the game. Most importantly our league need TV and we hope LMC has something in the pipeline. And kudos to the writer of the subjected article JohnPaul Nnamdi.